Or any other apocalyptic scenario? With all the post-apocalyptic movies, books and television shows out there right now, have you ever thought about where you would be if there ever actually was an apocalypse, zombie-induced or otherwise? Could you survive? Do you have any viable skills to contribute to a newly established community to help it thrive? Someone at book club the other night brought this up and I found it an interesting enough concept to write about. As I was thinking through my small set of survival skills (which didn’t take very long and mostly consisted of what I had read in fantasy, science fiction and dystopian lit), I came to the conclusion that I really would not be a vital piece of the survival puzzle. In fact, if my new community were to find a need to resort to cannibalism, I would probably be one of the first to go. And even in that event, I would not be much help. I don’t have a lot of body mass to sustain people for very long. Ok, moving beyond that gruesome image, after a quick Google search (ah Google, what would we do without you in the event of the apocalypse? 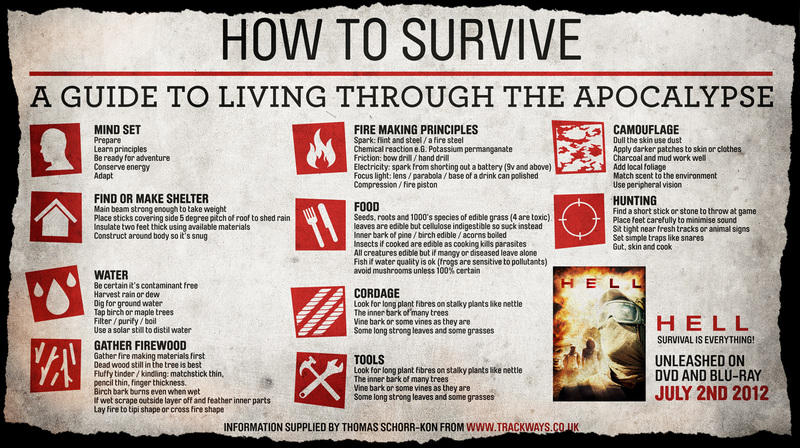 ), I found this helpful infographic that you could reference if you needed some ideas of what you should do to survive in the event of the apocalypse. I’m not sure what the movie attached to the graphic is about, but you can ignore that part. We won’t have DVD players anymore in the event of the apocalypse anyway. First, for the stake of humor, we’ll start with all the things I couldn’t help with. I don’t know how to shoot a gun or skin an animal, though I’d love to learn to shoot a bow and arrow. This is something I have bugged my dad about for a long time. But, quite frankly, the idea of shooting an animal, even for the sake of food, leaves me a little squeamish. The one thing I could do is catch a fish. I know how to put a worm on a hook. But, don’t ask me to make a hook. I don’t know the first thing about whittling. I might be able to put a band-aid on someone. Or, if we’ve gotten to the point that band-aids are no longer available, I have read enough Fantasy to be able to create a poultice. I doubt it will have any sort of healing plant or salve, unless I randomly happened to pick a plant with healing properties. And, to be honest, we’d be quite lucky if I managed to avoid snagging some poison ivy. Beyond dressing small wounds, count me out. I’m too squeamish to deal with lots of blood and guts or compound fractures. Along the plant lines, I could probably be a gatherer, but only to an extent. I have no plant or herbal knowledge. I love mushrooms, but if I happened across a patch of them, I wouldn’t know which ones were safe for consumption. I could gather firewood. That’s an essential too, according to the above graphic. But, I have a pretty poor sense of direction and if I wandered too far from camp, I probably wouldn’t be able to find my way back. The two most essential skills for survival would be the ability to make fire and shelter. As far as shelter goes, I don’t know anything about building things. I could probably make a lean-to, but I doubt it would be waterproof. With the first big storm, it would probably blow away. And even though I do know how to build a fire from little twigs up to a healthy blaze, without matches or a lighter, I’m toast. So, in the event of an apocalypse, what skills could I offer to the new establishment with any sort of confidence? The first thing that comes to mind is the role of the scribe. Someone has to write down our activities so that one day, people will know we existed after we’re gone. This skill could come in handy also if we have the opportunity to experiment, or if we learn how to make things, I could document the steps in our official leaflets. I could also keep track of births, deaths, and other important life events for our group. But if you are in full-fledged survival mode, leaving a legacy is probably not a top priority. And, paper is probably scarce unless you live near/within a city and can make it to a store that used to sell paper of any kind. It could be ripe for the picking. Paper doesn’t last long in the elements. But, if there’s paper, you could probably find a plastic file folder to keep your notes in. The second thing I could do is make clay pots. So I could make cookware which might be useful, provided there was someone around who knew enough to get food for us to cook. I could probably even help cook the food. But it would take some initial trial and error before I became comfortable with cooking over an open flame. Obviously, I have few useful skills to offer if I were to find myself plunged into the apocalypse. The point of this post is not to bring you down as you consider your own skills. Instead, this post is supposed to suggest to you that the number one trick to surviving the apocalypse is being prepared. I don’t mean being prepared as far as supplies go or even upping your knowledge and experience when it comes to survival techniques. I mean making friends with people who actually know how to do things prior to the apocalypse. Schmooze like your life depended on it, because some day, it might. Then, when the apocalypse happens, latch on to your contacts and friends like a limpet. Frankly, that’s how I plan to survive. As a last memento to you, I found a list of the different types of people you should be looking for to fill your group of survivors and to ensure your own survival, down to selecting the unlucky person who always ends up dying first in the movies. Good luck. Writer, out. Hahaha I love this! You write very well. I’m now not positive the place you are getting your information, however great subject. I needs to spend a while learning much more or working out much more. Thank you for magnificent info I was looking for this information for my mission. Reblogged this on All-Ways News Blog.